Despite lack of controlled studies, pressure therapy is empirically considered as effective for scar treatment. Generally 25-40mmHg is required, but occlusive dressing of scar area with lower pressure tape is also known to be effective. It is therefore considered useful to some extent to apply pressure with currently available DuoDerm, MediForm and common Band Aids. The mechanism of treatment is suspected diversely from reduced dermal thickness to reduced edema, and reduced fibroblast activity and collagen production due to low oxygen in the skin. Figure 1. Example of skin pressure. 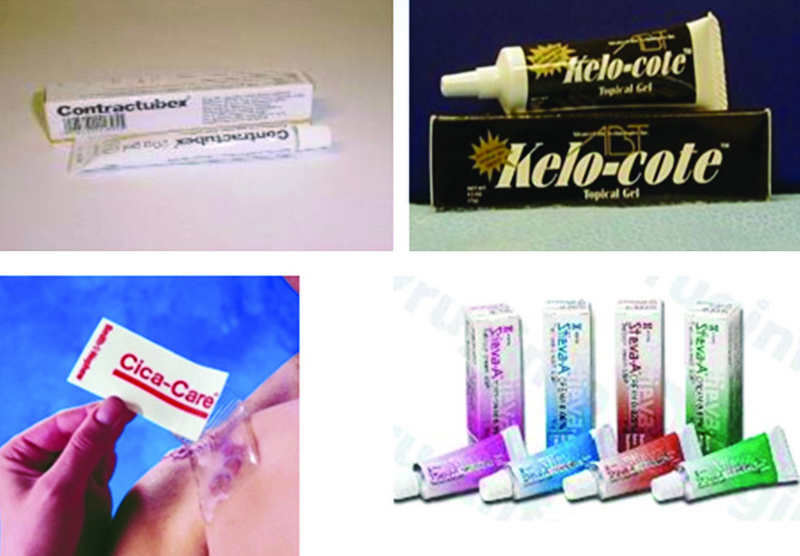 The effect of silicone gel on scar treatment has been published a lot in the literature. 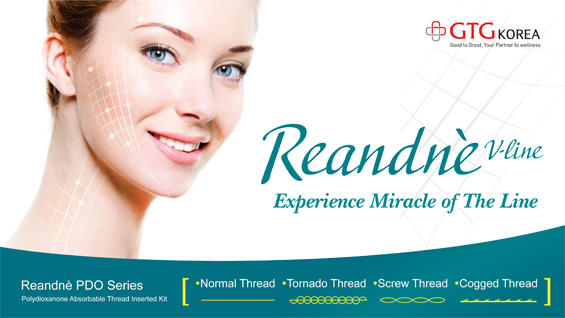 It is more useful for prevention of scar formation rather than for the treatment of scars already in place. For the purpose of preventing surgical scars, continuous occlusion for at least 12 hours a day for 3-6 months from 2 weeks after surgery is required. The mechanism of action is controversial, but it has been suggested that it is either the effect of silicone itself or associated with reduced secondary scar formation due to hydration induced by occlusion. Figure 2. Silicone gel sheet. 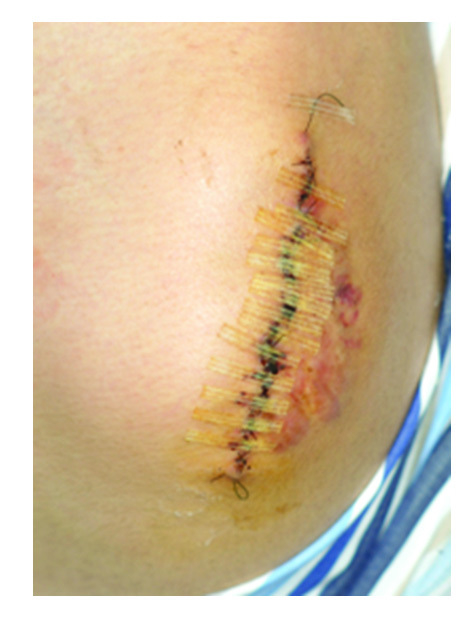 Steroids are most commonly used for scar treatment; among others, triamcinolone injection is most representative. The main mechanism of action includes reduced inflammatory response and inhibition of fibroblast growth and collagen synthesis. Recent studies have found the presence of inhibitory function of various growth factors and genes (TGF-beta, SMAD-1, etc.) associated with scar formation. Despite such effects, steroids are frequently associated with systemic (acne, hypertension and diabetes mellitus) and local (atrophoderma and vasodilation) side effects, requiring dose and concentration control depending on the scar. 5-FU is a pyrimidine analog antimetabolite. It is generally one of antitumor agents used for solid tumors. The mechanism of action is prevention of DNA synthesis and fibroblast growth, thereby reducing collagen synthesis as an inhibitory action against TGF-beta. 5-FU combined with steroid can make up for the side effects of each other, rather than when 5-FU is used alone. Figure 3. 5-FU injection for a keloid scar. Bleomycin is an antitumor agent as 5-FU, but is widely used for the treatment of warts in dermatology. The mechanism of action is similar to that of 5-FU, inhibiting DNA synthesis and fibroblast growth, thereby reducing collagen synthesis as an inhibitory action against TGF-beta. Systemic side effect has not been reported, but hyperpigmentation may occur as a local side effect. Generally, 0.5~1ml/cm2 with 1.5 international unit/ml is injected. Figure 4. 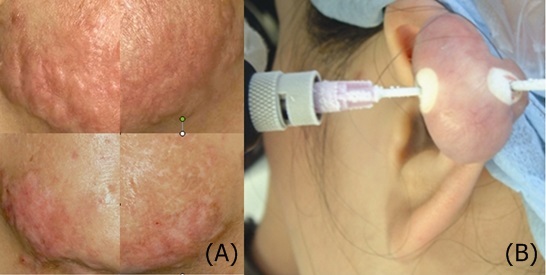 Bleomycin treatment of a keloid scar. Verapamin or trifluoperazine are often used, which have been already in use for contracture in other medical fields. The mechanism of action is the inhibition of production and secretion of extracellular matrix, including collagen, and increasing the production of collagenase. It is also known to reduce the synthesis of IL-6 and VEGF to inhibit scar formation. The therapeutic effect is not evident for clinically established scars but has been used for prevention of surgical scars in many reports. Interferon-alpha, beta and gamma can be used for scar treatment due to its inhibitory action of collagen synthesis. However, the price is high compared to the effect and the injection may cause flu-like symptoms. Generally, 1 million unit/cm2 is injected. Radiation therapy is used as an adjuvant therapy for prevention of recurrence after surgery, rather than as a monotherapy. It is hardly applicable to general scars, but is considered as the most effective method until now for inhibition of radiation therapy-induced recurrence after surgery in severe keloid patients. Cryotherapy can induce the most rapid reduction of scar, as with steroid injection. The accurate mechanism of action of cryotherapy on scar treatment is not known, but low oxygen condition induced by freezing seems to reduce collagen synthesis. The advantages of cryotherapy include the possibility of treating wide area within a short period of time depending on various scar sizes and lack of the risk of systemic side effect. Having said that, cryotherapy is also associated with many side effects, such as injection site pain, blistering, coloring and worsening of scar. The lack of standardization and great dependence on the operator’s experience also makes it hard to predict accurate therapeutic effect. Figure 5. (A) Cryotherapy for hypertrophic acne scar on the chin. (B) Intralesional cryotherpay for keloid scar of the ear. 5) Imiquimod: Interferon-inducing topical agent, reported as effective for prevention of surgical scars, including keloids.